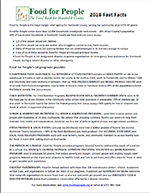 Interested in becoming a Hunger Fighter Team? We cordially invite you to participate in our 2018 Hunger Fighter Challenge—a community food & fund drive supporting Food for People during the holiday months. Last year the Hunger Fighter Challenge collected a total of 14,206 pounds of food and/or dollars—an impressive amount! This year’s Hunger Fighter Challenge goal is 15,000 pounds and/or dollars to support seniors, children, and families in need during the holidays and winter months. Each year dozens of businesses, schools, groups, and civic organizations participate in the Hunger Fighter Challenge. We encourage groups to create and customize their own collection containers or boxes with downloadable tools and signage available in the "Resources" section below. 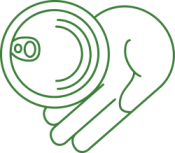 Think you’ll need to borrow a barrel, box, or coin bank from us? We can arrange it! This is our busiest time of the year, and it is helpful if your team can pick up and drop off to us directly. We’ll do our best to make arrangements for unique situations. Please read the Hunger Fighter Challenge rules, and then fill out our online Hunger Fighter team enrollment form as soon as possible, so we can support your team in getting started. Questions? 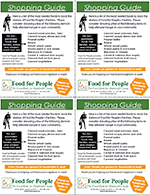 If you have questions, need materials or information about Food for People, would like to request a Hunger 101 presentation to inspire your group, or anything at all, please don’t hesitate to contact us- we are here to support you. Email us at FoodDrives@foodforpeople.org or call (707) 445-3166 ext. 320. We look forward to working with you this year! NEW THIS YEAR - create your very own Hunger Fighter Team donation page to share with friends and track your goal. Did you know that we can stretch your team’s dollars with our wholesale buying power? When your team donates funds, the impact is larger—and it’s easier to lift! It’s easy to set up - CLICK HERE. Select “Create My Own Fundraising Page.” Once your page has been created you can personalize it with photos and info about you or your Hunger Fighter Team. What are the rules and how do I get involved? Please click here to download the 2018 Hunger Fighter Challenge rules and details.